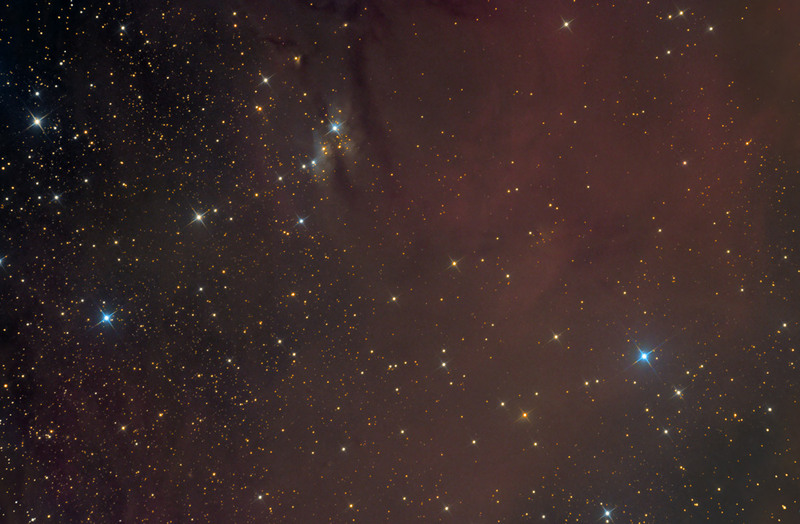 This image covers a part of the Barnard's Loop in the constellation Orion, about 1° northwest from the star Saiph (κ Orionis). Two reflection nebulae are visible in the foreground: VdB 55 and VdB 58 (see the annotated mouseover). The lighting star responsible for 55 vdB is HD 38023, a blue-white star of the main sequence of spectral class B4V with a magnitude 8.90. Parallax measurements indicate a value of around 3.10 mas, which places the system at about 323 parsecs (1052 light-years). The nebula is crossed by a dark band that divides it into two parts, one to the southwest, where the star is illuminating, and a smaller one to the northeast. HD 38023 is also the dominant star of a young open cluster known as L1641-S, designation that is derived from the number of molecular cloud in which the cluster is located, LDN 1641. The other reflection nebula, VdB 58, is a very weak gas filament lit by a star of apparent magnitude 10.0, cataloged as BD-08 in 1208, which has a reddish color, also impressed on the nebula.